A very pale yellow butterfly came visiting a few weeks ago. Being both a gardening and butterfly enthusiast, I’m always on the lookout for these beautiful insects as I potter around in our garden. This time, while weeding yet looking up every now and then, I spotted this tropical beauty flying in and headed straight towards our Bauhinia kockiana, a climbing vine almost 2.5 meters high. I didn’t rush inside for my compact camera as these fast flying butterflies hardly stop for long and are such teasers, leaving as fast as they fly in. Nevertheless, I could see that this Catopsilia pomona pomona that clung to a Bauhinia kockiana leaf seemed perfectly happy to be there for quite some while, probably shading itself from the afternoon sun. It was still at the same spot about 5 minutes later…so I was tempted to get my camera. And, happily managed to capture 8 lovely shots with both my arms raised to reach it! A pity though that all images were similarly posed, none with wingspan spread out! 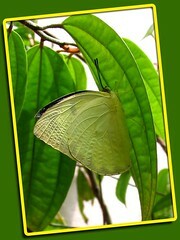 The Lemon/Common Emigrant is medium sized with a wingspan of 6-8 cm. It is common, widely distributed, and even seen in urban areas. A robust and fast flyer that got its name from its migration habit. This species is represented by 2 distinct forms, namely the form crocale with black antennae and underside of wings devoid of silvery spots or rings, and the form pomona with pinkish or red antennae and underside of wings with silvery spots outlined in red at cell-ends. And, even within each form, there are considerable variations. The development of these forms has been connected to photoperiod and temperature during growth. It had been noted that both forms fly together and are not seasonally separated. Check the site of Singapore Butterfly Interest Group to know more and see images of the variable forms for identifiable characteristics. Now, I’m positive my Catopsilia pomona with the blackest ever antennae is of the crocale form, but is it the female form jugurtha? Hehe…I’m more confused now! Distribution: Sri Lanka, India, Myanmar, Malaysia, Singapore, New Guinea and parts of Australia. Habitat: Abundantly found on the plains, and especially secondary growth areas including public parks and our own gardens. Hello…Looking for info on a pale yellow butterfly we have in our hay field…by the thousands….67 acres of clover and ragweed hay…..I do not know what kind they are or why they are here in NW Ohio….Thanks…. Hi Marilyn! Wow, I’m awed by such a phenomenon! Hmm….for us city dwellers, to see even three butterflies together at any one time is a much-awaited joy!